The Notre Dame Institute for Advanced Study (NDIAS) welcomes applications for their 2019 – 2020 fellowship program. Two types of fellowships, the residential fellowship and graduate student fellowship, are available through the program and available to applicants from universities and institutions around the world. Interested scholars must apply online by midnight on September 17, 2018. NDIAS welcomes applications from academic faculty, independent scholars, public intellectuals, and professional researchers in all disciplines, including the arts, engineering, humanities, law, social sciences, and natural sciences for its residential fellowships. Those interested may apply either for one semester or a full academic year, with shorter stays sometimes possible by special arrangement. Likewise, NDIAS encourages applications from eligible graduate students in all disciplines, including the arts, engineering, humanities, law, social sciences, and natural sciences, whose interests and ambitions align with the Institute’s objectives. Graduate student fellows participate in the program for a full academic year. 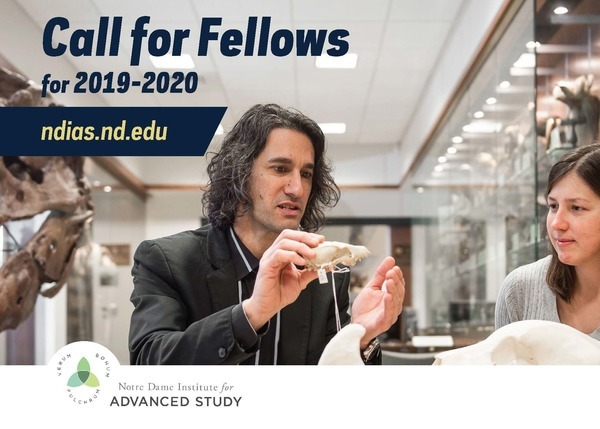 To learn more about the NDIAS fellowship program, including eligibility requirements, our alumni fellows, and to access the online application, please visit https://ndias.nd.edu/fellowships/. Originally published by Brandi Klingerman at research.nd.edu on August 17, 2018.